All three of the division’s frontrunners were made to work desperately hard to maintain their status with only Rotherham able deny their opponents a losing bonus point, albeit with the clock on zero. There were plenty of fireworks at Headingley with three tries from Leeds in 10 minutes either side of the interval before London Welsh ignited in the final quarter to recover from a 12-point deficit for the second time this season. The Welsh were as cut up as large sections of the Headingley turf when referee Mr Steve Lee ran beneath the posts in the 50th minute after their fifth scrum infringement. Alex Lowozski’s conversion stretched the home side’s lead to 24-12 and an upset looked on the cards. But aside from having major problems at the scrum, Welsh created a host of opportunities in the first half but squandered all bar two with inaccurate handling and poor decision-making. Welsh finally got on the scoreboard after 28 minutes when loosehead Nathan Trevitt finished off a handling move involving the entire front row to cross in the corner. Two minutes later Nick Scott dotted down in exactly the same place, when Welsh tapped and went from a penalty. Scrum half Alex Davies replaced the normally metronomic Gordon Ross, unsuccessful from four attempts at goal, and converted from the touchline. The Leeds response was immediate with Fred Burdon on hand to finish off a fine break from Stevie McColl in the last minute of the first half; and when Lowozski knocked over the extras, to add to his second minute penalty, it was game on. The second period had barely begun before Callum Green barrelled over to round off another fine piece of work from McColl. When Welsh made wholesale changes following the penalty try, there was a reversal of fortunes at scrum time. Davies converted a penalty before Scott exploited soft-shouldered Leeds tackling to bring the Exiles within a score. Davies added three further penalties — including a rocket from wide on the halfway line on the stroke of time — to complete the renaissance. There were no damp squibs at Brickfields either on Saturday with 10 tries in this pulsating encounter. Despite outscoring the hosts by six tries to four, it took Bryan Rennie’s 80th minute try to secure the points for Bristol. However, Chris Elder had the final word for Plymouth with a 40-metre penalty to bring up Albion’s second bonus point. 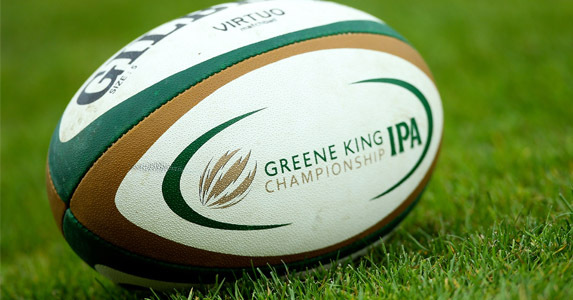 The game produced two try hat-tricks: Tom Bowen for Plymouth and George Watkins for Bristol. Three first half tries were enough to bag for points for the Titans at Clifton Lane on Saturday, although head coach Lee Blackett was disappointed that his charges failed to notch the bonus point. But it could have been much worse for Rotherham, as Mark McCrea dropped the ball in the act of scoring for Jersey, and it took Pablo Socino’s 80th minute penalty to make the game safe for the Yorkshiremen. Not only did Moseley notch their first GKIPA Championship win in this dogfight at Vallis Way on Friday night, but they also managed to ensure that their hosts are yet to record their first league point. A try either side of half time in reply to two first half Tom Wheatcroft penalties was sufficient. In a game lacking the quality of last season’s Championship semi-final when the two sides last met, Bedford looked to have done enough to record their second league win when James Pritchard knocked over a late penalty only for Matt Jarvis to win it with a last gasp effort. Don’t miss this week’s top of the table clash when London Welsh take on Bristol at the Kassam Stadium on Saturday, 2.30pm kick off.